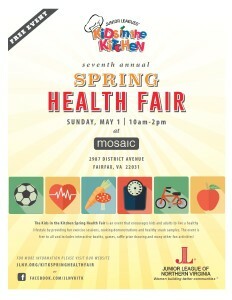 Join the Junior of League of Northern Virginia at its seventh annual Kids in the Kitchen Spring Health Fair on Sunday, May 1 from 10 a.m. to 2 p.m. at Mosaic (2987 District Avenue, Fairfax, VA). The Kids in the Kitchen Spring Health Fair is an event that encourages kids and adults to live a healthy lifestyle by providing fun exercise sessions, cooking demonstrations and healthy snack samples. The event is free to all and includes interactive booths, games, raffle prize drawings and many other fun activities!